UPDATED: Tue., March 19, 2019, 10:47 p.m.
A Spokane County grader was struck by a semitruck Monday morning south of Spokane. Injuries were reported, but none is considered life-threatening, Washington State Patrol Trooper Jeff Sevigney said. The crash occurred about 8 a.m. on U.S. Highway 195 at Spangle Creek, 19 miles south of Spokane. The grader was headed south from a county road district shop into an area to clear snow from the side of a road when it was struck by the semitruck, which was traveling 60 mph, said Martha Lou Wheatley-Billeter, county spokeswoman. The Washington Department of Transportation and WSP are investigating the incident, but a preliminary report indicates the semitruck driver reached to grab something in the cab, became distracted and struck the grader, Wheatley-Billeter said. 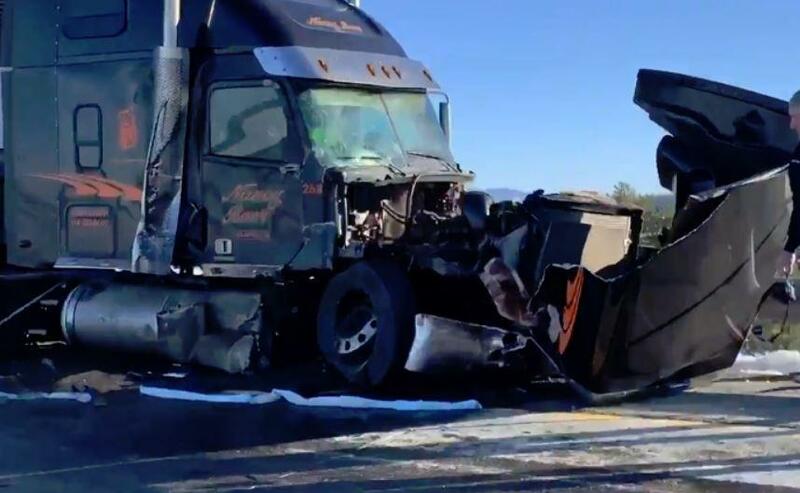 The semitruck driver struck the guardrail, which prevented the vehicle from sliding off the road and potentially saved the driver from serious injuries, she said. The grader was a total loss and had to be towed to the county’s road maintenance shop. Published: March 19, 2019, 9:42 a.m. Updated: March 19, 2019, 10:47 p.m.